Which is why finding just one amazing free activity in a foreign city can be so liberating. Beyond the activity itself, a fun freebie can go a long way to putting your mind at rest that you're not over-spending. 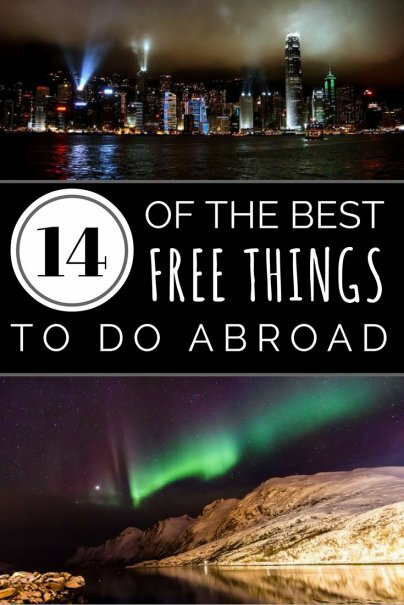 So if you're thinking about a trip sometime soon, or just want to be reminded that you can take one without splurging on everything, check out this list highlighting 14 of the Best Free Things to do Abroad. The Guinness Book of World Records calls it "the world's largest permanent light and sound show." You'll call it "free". Enjoy the show that involves over 40 buildings along the impressive Victoria Harbour, and synchronizes laser beams, spotlights, and music. Americans often think of ferries as ways to commute, not beautiful scenic tour-boats. And very rarely to they think of them as free. But so it is with the ferries that leave just behind Amsterdam's Central Station and take you to all sorts of different downtown neighborhoods. "The grand of dame of Singapore" feels like it should cost you and arm and a leg just to walk through the colonial majesty of its grounds… but it doesn't. Just don't even think of staying the night if you're on a budget. Just outside the city, this enormous outdoor movie theater plays free movies (both classic and contemporary) every night during July and August. You're on an adventurous vacation in an exotic country looking for excitement. "Metropolitan government office" probably isn't the first attraction that pops into your head. But Japan's towering Tokyo Tocho building will change all that with its 45th floor (free!) observation deck providing views of the city and even Mt Fuji. Imagine what would happen if you plopped a 7.5 acre farm full of sheep, goats, and cows in the middle of Chicago or San Francisco? In Canada, they can get away with that sort of wackiness, most notably at this free farmland sanctuary tucked inside a bustling downtown neighborhood. Want to see works from some of history's best artists for free? Then don't go to an art museum, go to this holiest of Catholic holy sites filled the artwork of Raphael, Bramante, and Michelangelo. Denmark may just be home to the world's most bikeable city, and the Danes want your pedal power so badly, they'll let you ride for free with the Go Bike bikeshare. Just pop in a small coin deposit, and hours of parks, beaches, and 17th century neighborhoods later, lock the bike up and you'll get your money back. It would be very, very difficult for the Norwegian government to charge you for looking up. So take full advantage by visiting in the winter, and more than likely seeing the sky turn green without having to spend any green. Until 2012 the largest rooftop garden in Europe, this charmingly lush 1.5 acres are free and open to the public, but not visible from the street, so locate them by looking for the Virgin flag. Though walking up the bridge's catwalk can cost an arm and a leg (also what you'll lose if you fall…), walking across the bridge is free, and provides some amazing views of the city skyline and famed Sydney Opera House. Even Charlie's golden ticket cost the price of a candy bar. Not so at the home of the world's most famous (real) chocolate, which offers free tours. Just because it's free doesn't mean you don't have to work for it. But if you're willing to dress up like Old Saint Nick, you can hit the slopes at Le Massif in Charlevoix at no charge. The most-visited art gallery in the world is also… the free-est! Except for special exhibitions, there's no charge to visit London's famous museum. Done any equally amazing (or more amazing) free activities aboard? Then help grow this list by sharing in the comments below!